Star Wars Vader Down #1 1:4999 Zdarsky Sketch Variant Ultra Rare CGC 9.6. Ultra-rare collectible comic with and estimated less than 25 in the world. Up there with the 35c variant of Star Wars #1 as the most collectible, and rarest of the Star Wars comics. I've just had the comic freshly graded and encapsulated at CGC and will post pictures early next week in the new holder! I just wanted to get these listed before I headed off to Comic-con! Any questions, then please drop me a line! From Recalled Comics awesome resource site, check it out! This is the 1 in 4,999! Retailer incentive variant, with a mostly black and white cover by Chip Zdarsky, featuring Vader and Jaxxon. Rumour has it that it was produced to parody DC comics who had promoted a 1 in 5,000 retailer incentive variant of Dark Knight III: The Master Race #1. Vader Down made it to retailers first, a week before Dark Knight III, with many variants, including a full color Zdarsky variant. At the beginning of December 2015, around 16 copies of the 1:4999 variant had been available for sale (note: at least one may have been for sale more than once). Please see my other auctions! I have others including key copper age TMNT's #1 (1st Printings), Bone #1 (1st Printing), Primer #2, and Albedo #2 (all high-grade), as well as rare early moderns and ultra-rare variants like the super-rare Vadar Down (1:4999 variant), God Hates Astronauts, Cursed Pirate Girl, Over the Garden Wall, Adventure Time, Wytches recalled edition, Hellboy etc. Apologies in advance for this! 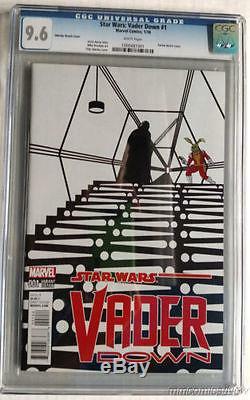 The item "Star Wars Vader Down #1 14999 Zdarsky Sketch Variant Ultra Rare CGC 9.6" is in sale since Saturday, July 16, 2016. This item is in the category "Collectibles\Comics\Modern Age (1992-Now)\Superhero\Star Wars". The seller is "nick_bridger" and is located in Los Angeles, California. This item can be shipped to United States.